Kuala Lumpur : Menya Musashi, The Intermark. Photos taken with Sony Xperia Z2. We were looking for a quick lunch before rushing off to look for a doctor. Nothing beats ramen than ramen in pork broth! Walking the depths of The Intermark at the Lower Concourse to find food, you will walk past Menya Musashi thinking it is a posh ramen place but you’d be surprised at the value. 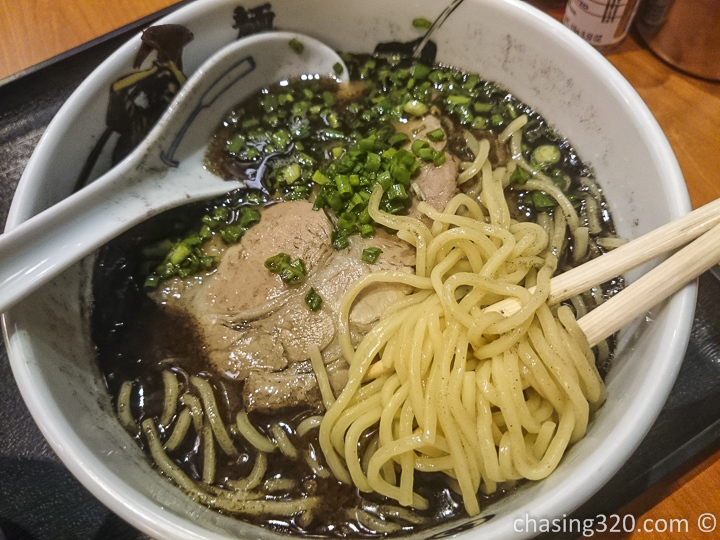 Menya Musashi is a simple ramen place that gives you Japanese food at an affordable place. Of course, no sushi. This was my set. I chose the shallot and garlic flavored pork broth. (Black per their menu). On top of that, my set was served with terikayi pork and rice! If the noodles did not fill you up, hit this one and you will start to feel your belt buckle being a bit limiting. This salad takes the top! Having sesame oil, the well diced lettuce was textured to perfection. Drizzled with light thousand island sauce, this probably is my favorite salad. I could swear the dressing was a Japanese version of Thousand Island. How much? RM28 for ramen, rice, green tea and salad! What value! The ramen noodles were springy and tangy. I am not a fan of bloated noodles overcooked but Menya Mushashi did not disappoint. If you enjoy a slight bounce on your ramen, this one is for you. The pork broth was sweet and savory. It was slightly oily but what do you expect from pork broth? This dish is the same but with Onion flavored pork broth. I felt this was much better and matched my palette more. This set came with Chicken Karage, well fried and moist. The chicken meat was tender and soft. This set went for RM26, so you get a very filling meal high in quality and quantity too. I’d recommend coming here for the ramen as it is very good. The broth could do with a bit of salt but let’s not add salt to our already high sodium life. Come for the promotion set and leave happy and full. I am going to return for this ramen.